King King – the name that says it all. 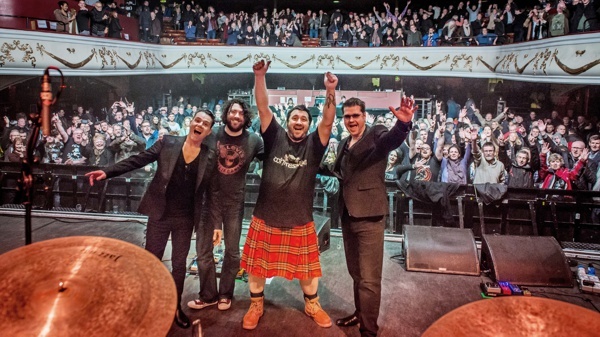 It had already been impressive just to enter that royal, historic hall of the 02 in Shepherd's Bush in London where Scottish band King King started their promotion tour for their fourth studio album 'Exile and Grace', before touring the UK and Scotland. The hall was packed and indeed the stunning atmosphere of the venue suited the exclusive band name. The lights then shut down and AC/DC's 'You Shook Me All Night Long' boomed out of the speakers before the band hit the stage, with Lindsay Coulson on bass, Wayne Proctor on drums, Jonny Dyke on keyboard and Alan Nimmo on guitar and vocals. To represent his Scottish roots, the latter was wearing his kilt. They started with 'Gimme No Lovin'' (from their recent album) to keep up the power and good mood of the opener. Nimmo and his band were obviously very pleased to play in front of so many people and immediately his sympathy connected with the audience. Their next song 'Waking Up' was part of their third studio album 'Reaching For The Light' and it reminded me of an American road ride, with the sound of fun, freedom and Nimmo's warm power vocals on top. The catchy chorus invited the audience to sing-along. 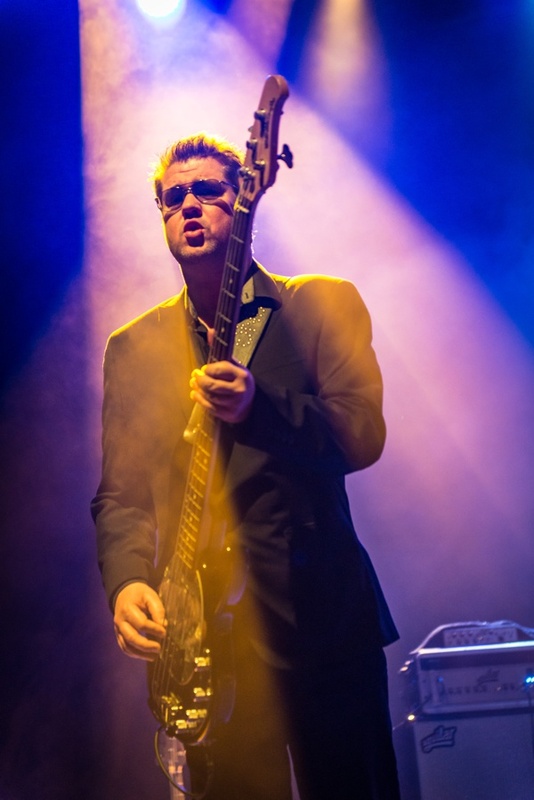 Nimmo proved the depth of his voice with the next song 'You Stopped The Rain' where he started with vocals and guitar only, before the band kicked in and brought the dynamic music back. Although the song is based on a relatively simple chord-structure, the memorable riff of the lead guitar encouraged the audience to sing on. As one listened to the great lyrics "You stopped the rain, you saw the light, when you walked into the flame, the darkness took his side, at the end of the world, a man he stands alone, there's a shadow, in the last real life, see, you better come on home", it was clear the meaning was deep and left space for interpretation, but it also appealed to a wide audience. 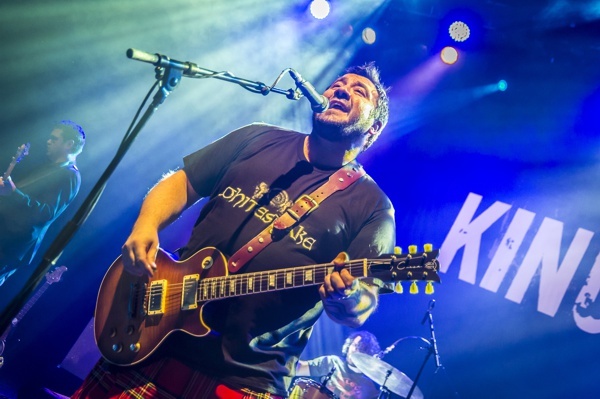 Especially great melodies, powerful lead guitar solos and the great groove of the band makes King King more than just a Blues/Rock band, they have a strong commercial potential as well. They can write more than just broken-hearted songs, which they proved with the next song 'Broken', a critical point of view about the current world situation. Keyboardist Dyke was featured on 'Long History Of Love', a slow 6/8 Blues track which had an intimate and soulful vibe that reminded me of Prince's 'Purple Rain'. Dyke impressed everyone with a stunning organ solo, before Nimmo took over on guitar, that is until the band dropped down and brought the dynamic to a minimum. That control of dynamics from the whole band was incredible and showed how much feeling they have and how well they all knew each other. 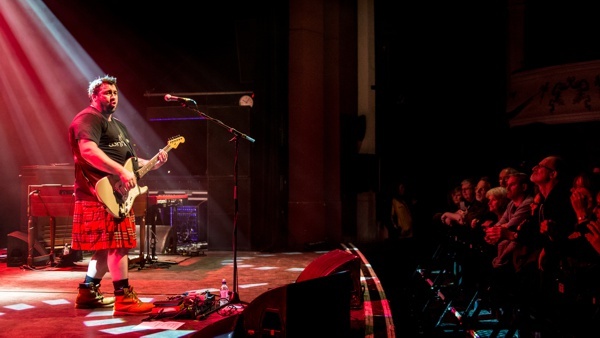 The audience could also hear the soulfulness, great vibration and clean riffs of Nimmo's voice. A 'Long History Of Love' does not only make them "better men", but also a long history of music makes them a fantastic performing band with a wide variety of styles, which could be also heard through 'Lose Control', a Rock/Blues number where they brought back the speed and wildness. Throughout the entire night, and despite the rather large space of the venue, the band kept their connection to the audience. There were some good laughs in between Nimmo's talking. With 'Rush Hour' you could see how many established fans the band had, many who recognised their songs within the first few chords. King King definitely stands for sympathy and their smile immediately allowed everything to flow to a good mood. In the end, we got invited again to take part on a call and response session and, of course, with so much positivity on stage, no one was able to resist the call to sing-along and shout out a loud 'Rush Hour'. 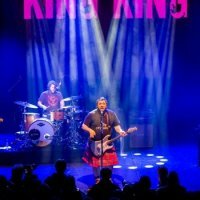 King King showed one of their highlight performances with 'Stranger To Love' where they did a massive build up for the lead guitar solo until everybody completely dropped out, Nimmo switched off the volume of his electric guitar and the whole hall was quiet. He did a solo part without any amplification, but due to the great acoustics of the hall, we could even hear it up in the balcony area. That bit of craziness à la eighties Rock 'n' Roll worked out so well, that when the amplification and the band came back, the feeling and sound almost had an arena vibe. 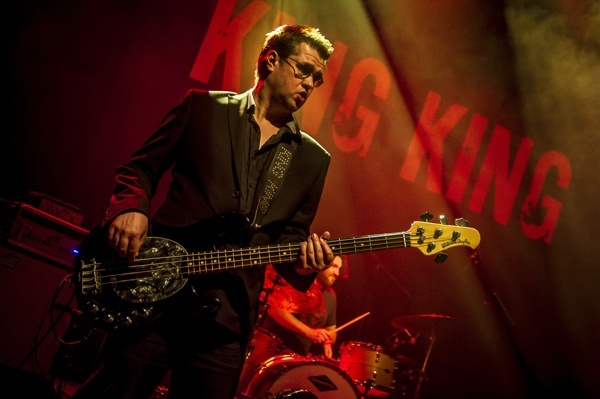 Not only are Blues, Rock and Soul part of their expertise, King King can also get funky. They finished the set with their groovy song 'All Your Life' from their latest album, before they added their beautiful ballad 'Find Your Way Home' and 'Let Love In' as encores. When you carry such a majestic name, you kind of expect a royal performance; King King is even more than that. They are fun, sympathetic, empathic, engaging and soulful. Their songs are diverse, catchy, interesting and relatable to a wide audience. They had an impressive change of dynamics throughout the whole show that kept the excitement levels up. Indeed, their musical performance was upper class, but King King is unified with the heart of their audience. They lifted us all up to their kingdom and made us feel privileged to be part of such a crowned show. 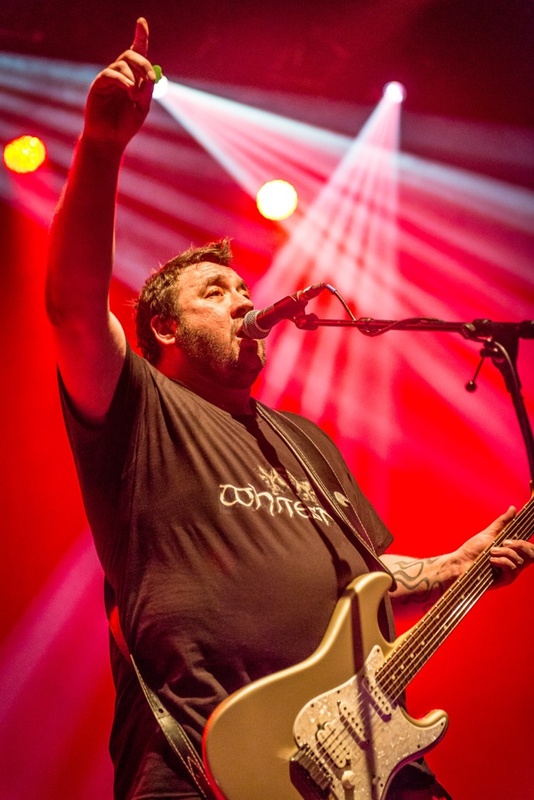 Click HERE to read the Rocktopia interview with King King.